Arizona 2013 Race Report: Dan Billingsley, 9:50, 2hr PR! Arizonawould be my 2nd Ironman, after completing Wisconsin 2010 in 11:48. In December of last year I decided to go all in. I needed to do two thing, loose some weight, and get a training plan to follow. I found a great nutrition plan on Training Peaks which limited myself to 1600 calories a day. To my amazement the pounds started falling off. At the same time I joined Endurance Nation. The past couple years I had been running with VDot and riding with Power, and really started seeing improvement. I was looking for EN to push me to the next level with their plans and give me some guidance implementing them. I think I read every page of the EN WIKI, and every download available. 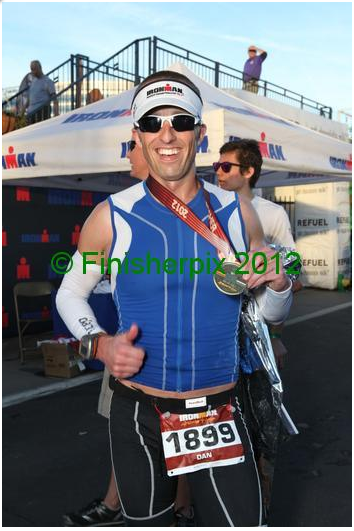 Leading up to Arizona I had PR’d in every race I did this year, including Steelhead 70.3® where I was able to go 4:38. I took some time off from work and did a big bike week in July (390 miles), and a big tri week in September (swim 8000, bike 410, ran 28). I did every bit of work EN asked of me throughout the year. Going into Arizona my FTP was 274, my VDot was 54 my weight was 145. My swimming was also at its best (best for an average swimmer). I had some wild notion and thought I could go sub 10 on a really good day if 200 watts could buy me a sub 5 hour bike. I just figured I could swim a 1:15, bike 5, and run a 3:30 (my marathon PR was 3:29). My goals might have been lofty. I was scared to death of the swim. Dark and a Cold 62 degrees. I wore a full suit with neoprene cap and booties. The cannon went off and I was getting clobbered. I had only started about 5 deep, and About 100 yards in I turned over on my back and took a deep breath. This was not going my way. The year flashed through my head. I had to convince myself that I was well prepared and to put my head down and swim. It seemed that every few hundred yards on the way out, I would hit a huge group and get beat up for 20 seconds. The way back was much better. I felt pretty strong in my pull, and was now hoping to make up some of the time I lost on the way out. I reached the stairs, had my wetsuit stripped, and started running to get my bike bag. I didn’t wear my garmin in the water so I had no clue what my swim time was, but I felt pretty good about it. I wouldn’t know what my time was until the race was over. I am not sure what took so long for transition. I think the arm coolers and cycling gloves might have taken too long to put on but they were comfort items for the long day. The bike was 3 loops and I knew I had to do a 1:40 per loop to do 5 hours. I know EN encourages JRA “just riding along” pace out of the gate, but I didn’t have time to lose. On the way out we had a slight headwind going up hill. On the way back I was flying downhill all the way to town. I hit the turnaround at 1:36, 4 minutes fast. I figured that was money in the bank that I might need later. My NP was 208 watts. The second loop seemed to be a little harder, I started to think I might have over cooked the first loop. But I kept my power numbers in check. The wind seemed to be changing up, not sure what it was, but it was different. I came into the turnaround at 1:39, still below my 1:40 goal with a NP of 203. I saw my family cheering, this was a huge boost to start the third loop, it was like they game me superpowers. Starting the third loop the wind had shifted to a tailwind on the way out. It was a nice push up the Beeline. My average speed stayed over 22 mph on the way out, that was a big bonus! I headed back to town and decided to not worry too much about my power on the downhill. I knew I would beat my goal and could give my legs a rest. I came into T2 with a 1:38 on the last lap and an NP of 199 for a total bike NP of 203. I was ecstatic! Once again running into transition my family was there yelling for me. I had goosebumps and felt like I was floating though. This was where the day started. I had been looking forward to this “Mary” for two months now. I felt amazing coming off the bike, but I had to pee. Yes, I tried to on the bike but couldn’t do it. The porta potty was not close enough in the transition so I figured I would run until I found one. The first mile is always fast, but I tried to slow down. I was doing 7ish pace and hit a open porta potty on the course. Oh that felt good. I jump back out and still finish the first mile in 8:25. Ok, now it was time to slow it down for the first 6 miles or so. Mile 7 came I dropped the pace and I decided I had better take a Powerbar Gel. It about made me throw up. I had to stick to liquids. I think I still stayed pretty conservative, I was worried about mile 18-20 and if I could hold it together without cramping. The miles just ticked off, and I still felt great. This was crazy! Starting off the lap I spotted my family, I stopped and turned around high fiving them, saying “just one more lap!” I was too excited! I was running strong. Just after mile 22 I heard someone say something like “it was only 4:15pm.” At this point I had no clue what the race time was, I started getting even more excited. I just kept running, and running. I saw coach Rich standing on the course, I asked him for some love, he gave me a high five and said “get it done!” I ran the last 3 miles, it seemed like everyone was in my way. I was swerving and dodging just trying to get to the finish. I completed the loop and they directed me towards some parking lot and around the corner to the finish. I clock was sub 9:50, I had a smile on my face, I continued to run, high fiving everyone down the finishing shoot, including my family. I don’t think I could have had a better day! I pretty much followed the Jesse Kropelnicki, Core Diet plan from his EN webinar. Here is what I calculated.